Ucom launches a new autumn offer to acquire a 4G smartphone. 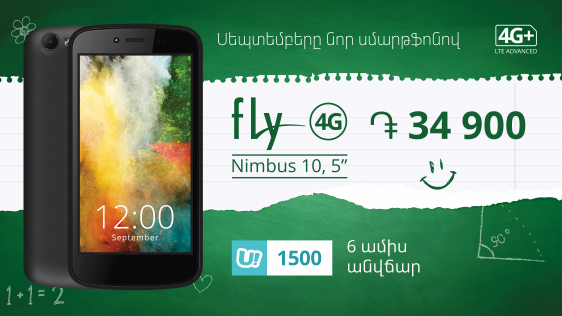 From now on, the 5-inch screen fly Nimbus 10 smartphone can be acquired without a commitment, at the price of 34 900 AMD only. Moreover, those who buy the smartphone, during 6 consecutive months will receive for free 1 GB of internet together with a bundle of unlimited calls to Ucom and MegaFon Russia networks. “All those who want to have a quality and affordable smartphone and enjoy the fastest 4G+ network in the region, should hurry to Ucom service centers and benefit from this offer”, - said Hayk Yesayan, Director General at Ucom.